As evening falls beneath the deepest black of a December northern sky, a thin veil of dark blue hangs streaked with vivid orange just above the pine trees. The homeward rush hour in Inverness is a muted, half-hearted affair, and in minutes we’re sailing past the bright lights of the bridge towards the darkness of the Black Isle. 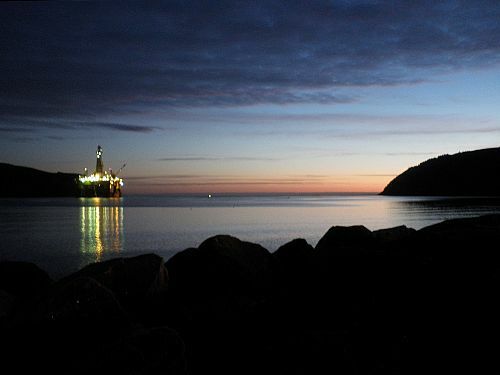 Half an hour ahead, the lights of Cromarty barely touch the depths of nightfall. The white houses of the Royal Burgh are hiding low against the shoreline. There’s a menace to the silence now, faintly interrupted as it is by the bleak moanful sounds of grinding metal and hammering. Across the water, just half a mile offshore, the leviathans of the deep are waiting. 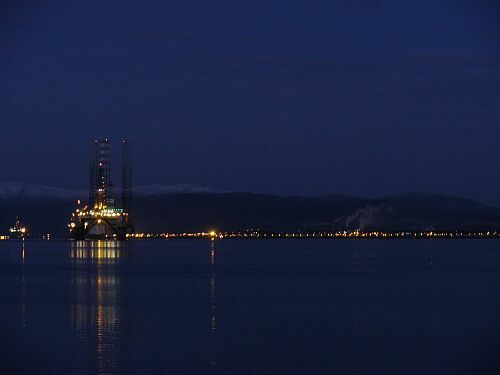 Here in the Cromarty Firth, oil rigs from around the world are waiting for the calmer seas of spring, wintering inshore through maintenance and upgrade programmes to equip them for ever deeper, more challenging drilling as our quest for oil expands. Twelve hours later, the hotel door creaks as I fumble my way outside. It’s still completely dark and a thin frost lies upon the road ahead. I didn’t sleep last night. We left the Cromarty Arms in good spirits — the ale, hospitality and food were warm, and they even offered up their old acoustic for a rusty bar or two. But it was the late-night tales of our hotel’s friendly ghost that kept me wide awake and wary, beneath a light bulb I didn’t dare switch off. The run out of town takes no more than a minute. A few dozen houses fall swiftly behind me and then I’m alone in black empty silence. Amidst the cold darkness of the Cromarty Firth, the deck of a semi-submersible is bathed in sodium orange as work continues around the clock while the onshore world is waiting for daylight, still an hour away. Across the water, another scatter of lights marks out the engineering yard at Invergordon, where drilling and heavy lifting equipment is being prepared for future wells in the North Sea and far beyond. It’s a strange kind of juxtaposition, this, pitching the urgency of international offshore energy operations into the unspoilt calm of a sleeping Scottish loch. In the first ten minutes run, just a single car goes past, its driver peering grim-faced through a frosty windscreen on his early way to work in Inverness. And then it’s quiet for another mile of silent running before finally I turn back. 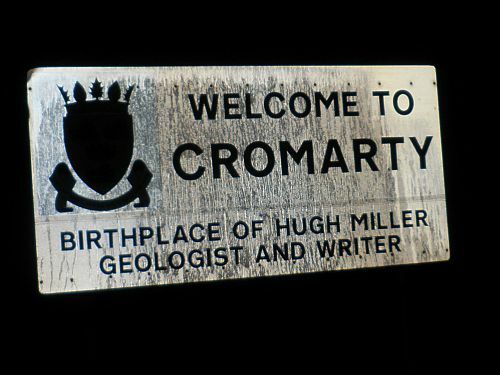 At the entrance to town, the sign announces Cromarty as the birthplace of geologist Hugh Miller, and I follow through the backstreets to find his house. 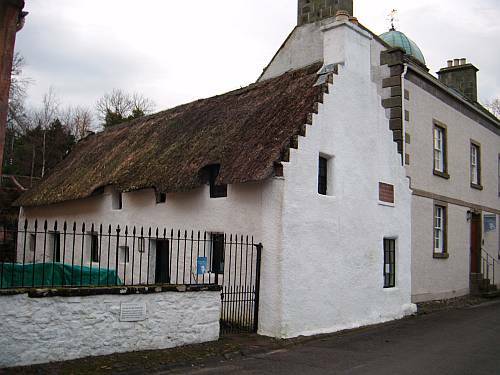 Born here in 1802, Miller was a self-educated stonemason who became a brilliant natural scientist and one of the foremost of all pioneering geologists, as well as a founder of the Free Church of Scotland. Miller was a gifted writer whose work showed that the Earth had been created over enormous time, with different species dwelling on it as life progressed through the ages. In the mid-nineteenth century, before publication of On the Origin of Species in 1859 and with Darwin’s great, world-changing thesis now formulated but as yet locked away inside his mind, these ideas were revolutionary – as they are still in much of modern North America. Cromarty’s Georgian merchant houses and chapel are mostly built from the same red rocks of Devonian age which formed the mainstay of Miller’s research. 400 million years ago, giant desert plains and lakes floored the Orcadian Basin in northeast Scotland, laying down a thick pile of strata which Miller assigned to the Old Red Sandstone – a lithostratigraphic term still widely used today. For many years after Miller, the geology of the North Sea lay quite unknown. Even when seismic surveying began around 50 years ago, it was widely assumed that deep fault blocks in the centre of the basin were of Devonian age, formed of rocks similar to those exposed along the coast. It was only when offshore drilling began in the late 1960s and 1970s that a thick and unexpected succession of oil-bearing Jurassic rocks was finally discovered. And across five decades since then, the North Sea has taken its place amongst the most prolific hydrocarbon basins in the world. Miller’s house stands deserted in the frozen twilight, and so I keep running. 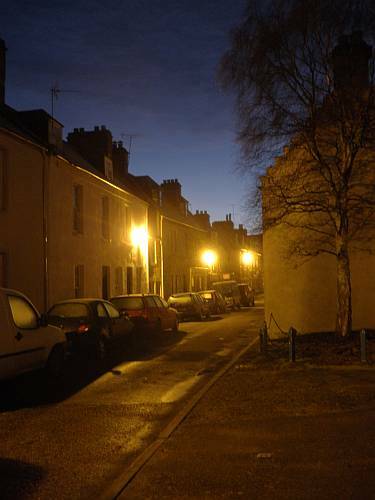 It’s almost eight now, but still far more dark than day as I wend my way through narrow streets and down to the shore beyond. It’s an imposing sight that greets me there, as the first faint light of a midwinter northern dawn is shaping the silhouette of a huge fifth generation deepwater semi-submersible, waiting for the day. Later on, I’ll board that rig, casting a seasoned eye at the sheer scale and complexity of the endeavour, so distant from the calm of this ancient Scottish fishing town, and yet finally the reason that I’m here. I pause a while to catch the view, and wander the last few steps along the beach. At the water’s edge, a solitary candle is burning, flickering lonely in the breeze beside the Emigration Stone, standing monolithic on the shore. 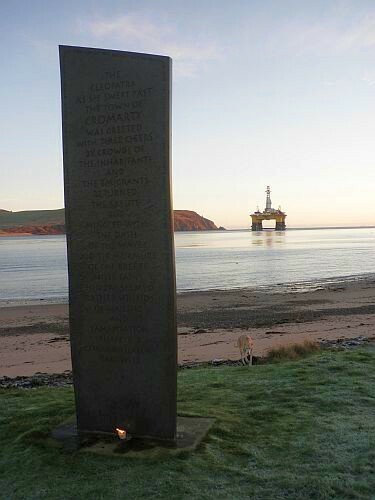 I stop to read the inscription of Miller’s words, telling of all the farmers and fisherfolk who abandoned their Scottish home for new lands across deep waters of the far horizon. In the modern age, a different generation of young Scots has found work across a nearer sea beyond the cliffs upon the North Sea rigs. 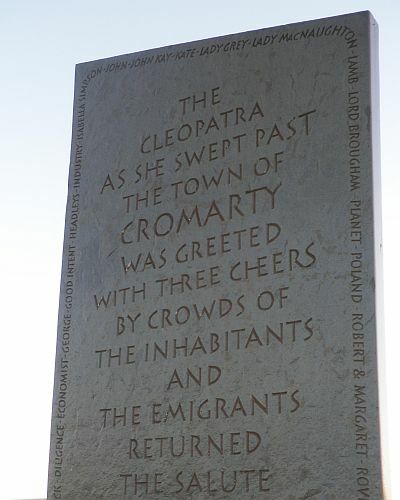 Remarkably, Cromarty has survived intact, sheltered from time and tides beside the Firth until today’s new prosperity arrived through Scottish devolution and the growth of nearby Inverness as a capital for the Highlands. For a moment as I watch, the past and future of this place stand still, inseparably bound with man’s harvest of the seas and the tales within the rocks. 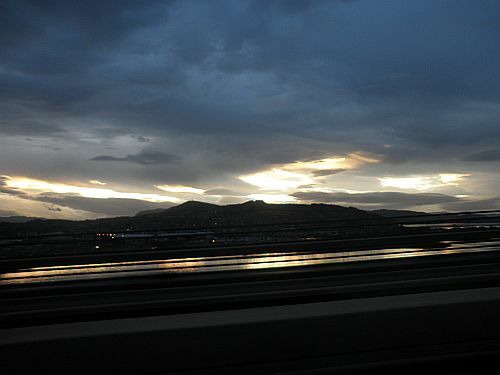 Could Miller ever have imagined that his beloved geology would one day bring a dawn like this? I turn my heels and run back towards the hotel. There’s a job to do today, and a new view from here to take forwards to tomorrow. This entry was posted in 2010, geology, heroes, history, peak oil, Scotland, winter. Bookmark the permalink. 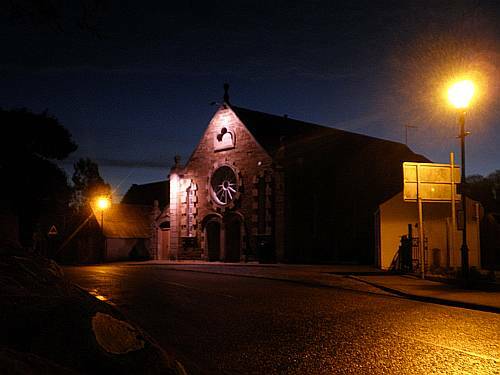 Cromarty has been been a town for the past 1,000 years. And as Royal Burgh until about 300 years ago, it’s really not a village. Thanks Tearlach, and corrected! Cromarty is a fine and noble town. Present population: 719. Hello there — great site. 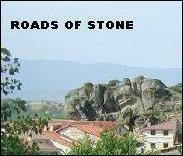 I have added a Woking photo collage of yours (with an attribution) on to my site where I’m writing about the town. Hope that’s OK with you — Matthew.